Can this home networking solution offer an alternative to WiFi? A power-line network like the BiPAC P104 could be just what you're looking for if your home network is cursed by WiFi blindspots, and trailing Ethernet cables around the house isn't an option. 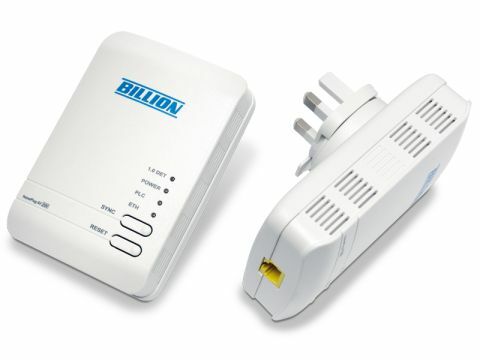 All you need is two spare electrical sockets and a power-line networking system such as Billion's BiPAC P104 HomePlug AV 200 Ethernet Adapter Starter Kit. By connecting your computers and/or router to the mains using the two supplied Ethernet adaptors, data is streamed over your home's electrical wiring, giving you an always-on network with the convenience of WiFi and the reliability of Ethernet. BiPAC P104 conforms to the HomePlug AV standard, so it can achieve theoretical speeds of up to 200Mbits/sec, real-world running speeds are unlikely to come close to this. It's also compatible with other brands of power-line network adaptors conforming to the HomePlug AV standard, so you can mix brands on the same network. Setting up is easy – just plug in and you're automatically connected. With the machines in adjoining rooms, the adaptors plugged directly into wall sockets and no other electrical appliances running nearby, the BiPAC P104 gave us read speeds of 42.08 MB/sec and write speeds of 37.92 MB/sec, which is around eight times the speeds we achieved using wireless-g.
We then tried a high-noise test by moving the laptop to a room as far away from the router as possible and plugging the adaptors into extension cables running several other electrical appliances. This had an inevitable, but far from disastrous, effect on transfer rates. Read speed dropped to 26.4 MB/sec with write speeds clocking in at 25.76 MB/sec, still far in excess of what was achieved wirelessly. You can handily adjust the position of the three-pin plug, allowing you to use the device in a vertical or horizontal orientation. The adaptors are bulky by necessity, so this versatility is welcome when trying to fit them close to skirting boards or other plugs. An excellent touch that rounds off a very strong product.